Seat reveals hybrid concept car | What Car? 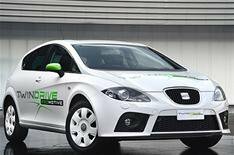 This is the Seat Leon Twin Drive Ecomotive, a hybrid concept car that could spawn a production vehicle by 2014. The Twin Drive uses power stored in lithium-ion batteries to run on electric power on short journeys, but switches to an internal combustion engine for longer distances. It hasn't been revealed if the engine will be petrol- or diesel-powered.